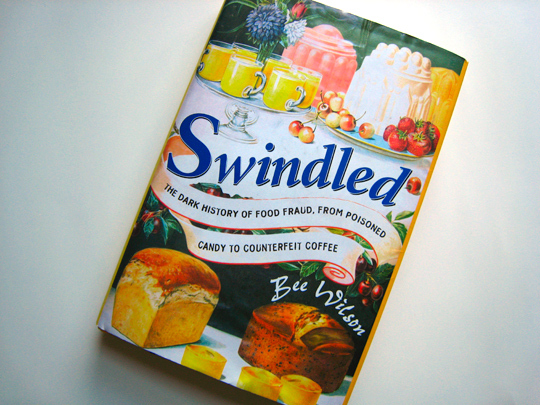 British author Bee Wilson's book Swindled: The Dark History of Food Fraud, from Poisoned Candy to Counterfeit Coffee (buy from Amazon ) was published in the UK in January of 2008 to some fanfare, but not too much. Then China happened. More specifically, news started flying out of China about tainted everything: poisonous toothpaste, adulterated cow's milk, soy sauce made from human hair. By the time of its release in the US in September, Wilson's book read like prophetic journalism, looking to our fraudulent past to warn us about our present. Food fraud is, more than anything else, about greed. 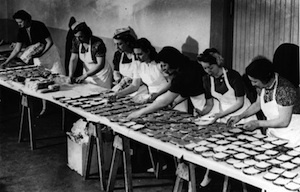 It's greed that drove Chinese food safety officials to turn a blind eye to powdered milk tainted with melamine, even though it resulted in the sickening of over 300,000 babies, and it was greed that drove Edwardian merchants to stretch their bread flour with sand, or pepper factories to sell the dust from the floors. Swill milk, false rice, "tea" made from the leaves of local shrubs, dyed green with copper — Swindled is the story of making an extra buck at the expense of everyone else — maybe it's harmless in small doses, but it can be catastrophic when everyone decides to start doing it at once. For such a dark tale, Wilson tells it lightly. This is an academic book, to be sure, but the voice is conversational and the facts approachable (if horrifying), littered throughout with wry asides. 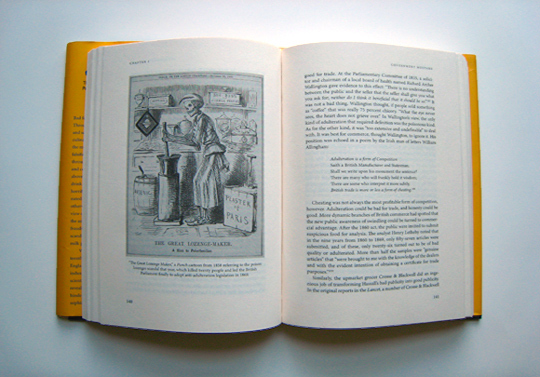 Wilson starts her story in late nineteenth century England, where the crusading chemist Frederick Accum sought to alert Londoners of the rampant adulteration of their food. While Accum's chemical tests for the purity of food had all of London paying attention, it didn't do too much for the long haul — throughout the nineteenth and twentieth centuries, it seems like Britain and America had more fake food than real. Which, in a twisted kind of way, is something to be thankful for, since they're so much fun to read about. Say what you want about me, but in the course of reading Swindled, I was almost uniformly more interested in Wilson's accounts of the swindles than of their fixes. It's not that I have any plans to open a crooked grocery that thins the ginger with rice flour and cayenne (and, for that matter, thins the cayenne with poisonous red lead). It's more that, as with any crime story, the tale of how the deed is done is so much more riveting than an account of attempts to pass laws to keep it from happening again. Who wants to read about the Pure Food and Drug Act of 1906 when there's so much to be read about sweetening foul wine with lead (ancient Rome, twentieth century France), pickles made greener by adding copper to the brine (nineteenth century England), or using a white-hot rod to sear out the rotten parts of a ham (The Jungle-era Chicago)? Even the tale of inferior Chinese black truffles masquerading as the far superior Périgord has a frizzle of mystery-solving excitement — while only 120 tons of Périgords are harvested each year, over 300 tons are sold. Sadly, this feeling of vicarious evil starts to peter out as the chronological narrative moves towards the modern era. The mustache-twirling villains move away from food adulterants, and towards food additives — there's Red Dye No. 2, of course, but also a king's ransom of stabilizers, color-holders, thickeners, thinners, emulsifiers, and flavorants. Yes, we get the shudder-inducing list of acceptable insect amounts regulated by the FDA (a jar of peanut butter may, by law, "contain up to 30 insect fragments per 100g and up to one rodent hair; tomato juice may contain 10 fly eggs or 2 maggots per 100 g"), but that's not so much fraud as it is just plain icky. It's not just that the topic changes: as we move closer to present day, Wilson's tone changes too. It becomes harder for her to mask the book's fundamentally academic tone, gone are the deadpan one-liners and fluttering prose of the earlier chapters, and she tends to flirt on the edge of pedantic. Beyond that, it's hard to shake the feeling that Wilson could have cut out some of the more repetitive elements of the chronological narrative — in each instance of fraud we find ourselves treading similar ground, moving from problem to identification to rectification, with no real reflection on how one instance of fraud might be viewed in the context of those that came before. The sloggy parts also serve to mask the book's real takeaway, a Michael Pollan-has-endorsed-this-message-esque reminder that the longer the chain between supplier and consumer, the more opportunities there are for things to go amiss. (Though she diverges from the Pollan agenda with her explicit indictment of laissez-faire government, and a corresponding call for more oversight.) This political agenda, extreme in its implication, resolves itself into something more palatable in the book's epilogue, entitled "Fraud in the Twenty-First Century." 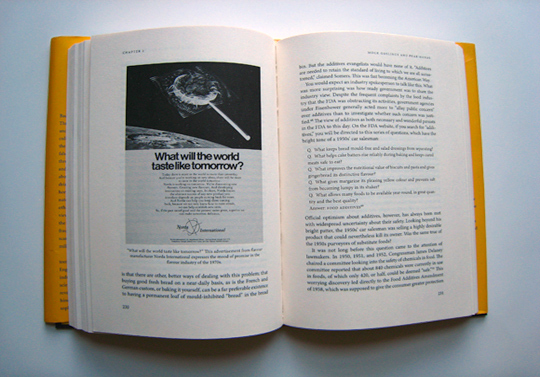 Far from enumerated the frauds of our millennia, Wilson instead uses those pages to tell us how we can arm ourselves against being swindled — eating organic, being aware of where our food comes from, urging the government to require more detailed labels. In the year or so since Swindled's original publication, it's been the case both that numerous Chinese food-safety officials have been sentenced to death for their participation (or intentional nonparticipation) in scandals that are too numerous to mention, and that a focus on organics and food provenance has become a near-obsession in Britain and America. In this kind of climate, Wilson's book is a must-read — whether you're a greenmarket obsessive, you're considering fraudulent actions punishable by death, or you're somewhere between the two.